The team analyzed little studied factors that play a role in ocean acidification (OA)–changes in water chemistry that threaten the ability of shellfish such as oysters, clams and scallops to create and maintain their shells, among other impacts. The U.S. Geological Survey defines pH as "a measure of how acidic or basic water is." The pH scale ranges from 0-14, with 7 considered neutral. A pH less than 7 is acidic, while a pH greater than 7 is alkaline (basic). Battery acid, for example, might have a pH of 1, while Milk of Magnesia might have a pH of 10. Changes in pH can tell scientists something about how the water chemistry is changing. In their research, Cai and his colleagues discovered a "pH minimum zone" that occurs at a depth of approximately 10-15 meters (~30-50 feet) in the Chesapeake Bay. The pH in this zone is roughly 7.4, nearly 10 times higher in acidity (or a unit lower in pH) than what is found in surface waters, which have an average pH of 8.2. This zone is suspected to be due to a combination of factors, most importantly, from acids produced when bottom water rich in toxic hydrogen sulfide gets mixed upward. The team reported the findings in a paper in Nature Communications on August 28, 2017. "This study shows for the first time that the oxidation of hydrogen sulfide and ammonia from the bottom waters could be a major contributor to lower pH in coastal oceans and may lead to more rapid acidification in coastal waters compared to the open ocean," said Cai, the paper's lead author and an expert in marine chemistry and carbon's movement through coastal waters. Previous studies, including work by Cai, have shown that acidification can be particularly serious in nutrient-rich coastal waters which often contain areas with too little oxygen and high levels of carbon dioxide near the bottom. However, scientists don't know exactly how much OA is occurring in a large bay like the Chesapeake Bay, though it is well-documented that agricultural nutrients entering the water have had a progressive impact on the Bay's bottom water's becoming anoxic, or oxygen depleted, during the summer months over the past 50 years. The Chesapeake Bay is the largest estuary in the United States. In addition to providing a thriving marine environment for tourism and outdoor recreation along the East Coast, the Bay plays an important role in the nation's economy through the harvesting of seafood including shellfish, like blue crab and oysters, and finfish such as striped bass. 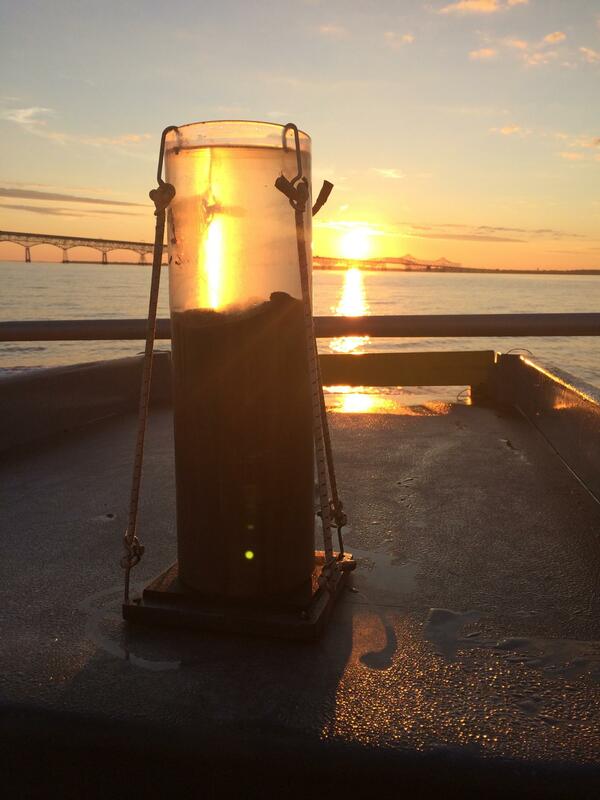 During research cruises aboard UD's 146-foot research vessel Hugh R. Sharp in August 2013 and 2014, UD researchers Cai and George Luther and colleagues collected water samples repeatedly from a deep basin of the main Chesapeake Bay. The researchers measured oxygen, hydrogen sulfide, pH, dissolved inorganic carbon and total alkalinity. As Cai analyzed the data from these cruises and another in April 2015, he noticed that the Bay's pH seemed to reach a minimum at depths between 10-15 meters. To explain this, Cai built a biogeochemical model to simulate the way oxygen is consumed and inorganic carbon and acids are produced to match the observations measured in the Chesapeake Bay. Using direct hydrogen sulfide measurements collected in the bottom waters by Luther, Cai calculated how much acid would need to be produced to explain this minimum zone. Cai explained that in the coastal ocean, in general, there is a synergistic effect on OA when excess nutrients introduced into the ecosystem from land cause plant overgrowth, a process known as eutrophication that upsets the water's natural chemistry and causes the death of marine species. When that organic matter sinks to the bottom sediment it is consumed by bacteria that respire, creating excess carbon dioxide that mixes upward into the water column. "The water is already lower in pH and when you add just a little more carbon dioxide and other acids, it creates a tipping point that leads to a decrease in pH" said Cai. He compared the results of his Chesapeake Bay model to data from the Gulf of Mexico, which is considered a well-buffered system that is able to counteract the changes from OA and keep itself in balance. But in large eutrophic estuaries like the Chesapeake Bay, the combined environmental and climate change stressors make the Bay more vulnerable, and the excess nutrients and increase in acidity may take a larger toll. "Given how widespread low-oxygen zones are in coastal waters worldwide, understanding these processes will allow us to predict the acidification of estuaries under expected increases in carbon dioxide and ongoing mitigation of nutrient inputs by management actions," said Jeremy Testa, assistant professor at the University of Maryland Center for Environmental Science. "These results will allow us to identify where and when shell-forming organisms like oysters will thrive or suffer in the future." The team's research shows that currently the dissolving of living shells and non-living aragonite and calcite minerals has provided a self-regulating mechanism to buffer or prevent the Chesapeake Bay's bottom waters from becoming acidic. But what will it mean for economically important species like oysters and clams if the overall ecosystem is pushed further out of balance? This is a question the research team would like to explore further. "There is a limit to Mother Nature's ability to self-regulate these systems," Cai said. The paper, titled "Redox reactions and weak buffering capacity lead to acidification in the Chesapeake Bay," was co-authored by Cai, Luther (both from UD) and colleagues at National Sun Yat-sen University in Taiwan University of Miami, University of Maryland Center for Environmental Science, CNPC Research Institute of Safety and Environmental Technology in China, Virginia Institute of Marine Science and Oregon State University. Wei-Jun Cai, the paper's lead author, is the Mary A.S. Lighthipe Chair of Earth, Ocean, and Environment. George Luther is the Maxwell P. and Mildred H. Harrington Professor of Marine Studies in the College of Earth, Ocean, and Environment. He holds joint appointments in the departments of Chemistry and Biochemistry; Civil and Environmental Engineering; and Plant and Soil Sciences. Support for the work included funding from the NOAA, National Science Foundation, NASA and from the Delaware Sea Grant program and University of Delaware.